Ever since Sasuke 24 finished and we saw the Banner for the Spring Renewal we knew there was a Sasuke 25 already being planned. That's the good news! When I turned on my computer yesterday afternoon I went to my usual places I check and right on the Sasuke Mania the official announcement of Sasuke 25 was officially announced! If you request to participate in SASUKE, please contact your local broadcasting station for details. We cannot accept applications directly. I'm frustrated about this line. For those of you who know my disdain for G4 this doesn't help at all. This is what I feared would happen when I griped over what G4 was doing in terms of monopolizing entries. I posted this on the Sasuke Maniac Forums but it bears mentioning here since this is where I do most of my complaining.. I am concerned at what the Americans (notably G4) have done to the application process. No doubt the Sasuke 24 campaign to circumvent G4's sheer stupidity (of not allowing ANY Americans go to Japan even though they were going to pay their own way) led to M9 throwing up their hands waving a white flag. I'm sure on top of the 2 thousand entries they get already from the Japanese that they got more from foreigners.. mostly Americans all saying that they will pay their way. G4 didn't help at all when M9 sent all USA entrants back to G4 to pick and G4 balked by not sending ANYONE to Japan (No.. Paul ANTHONY Terek is not a G4 invite.. he's a TBS invite - always has been) for Sasuke 24 (which despite not having any G4 was probably one of the best Sasuke tournaments to date). Ultimately as much as I love this show.. they are correct. It's their show and they can do what they want. That said.. I wish we can go back to the glory days when M9 was able to do whatever the heck they wanted and invite whoever they want. G4's inclusion has made it impossible now. Love them or hate them (you know my opinion on them) it raised the profile of Ninja Warrior worldwide and I'm sure that's the reason why M9 is backpedaling and walking away from their tried and true method.. they are simply inundated. For those who live in the United States.. you have one option and one option only. Wait for G4 to get their heads out of their rear ends and announce ANW2 (while they are at it they can show Sasuke 23 also). If they don't there are no Americans in Sasuke 25 like there was in Sasuke 24. It's not even an issue of budget since it's clear most people would pay for their own way if they are allowed an invite and G4 sent a film crew with a host to cover Sasuke 24.. it's all about G4 strangle-holding American entries through their little cable station in California that most of this country doesn't even have access to. If you are under the age of 21 you are not allowed to be on Sasuke because of G4's policy. Plain and simple. My hope though is now shifted to everyone outside the USA. We already know that Great Britain and Italy refuse to write back to their fans about Sasuke entries as M9 has stated in late December. Some countries haven't even shown the last 5-6 Sasuke' tournaments and some places like Singapore haven't even shown anything but a certain number of G4 episodes (not even in order and not even full tournaments) and that's it.. no new stuff at all. What's worse is that if Monster 9 is blocking all Foreign invites does that mean that people who don't even have Sasuke or Ninja Warrior in their country are effectively eliminated from ever applying to the show? Personally I hope it was just a message to the Americans to go back to G4 and not a global finger to the rest of the countries who are not represented as they do here in the USA. Only time will tell. 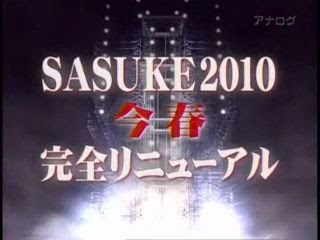 Edit: February 18, 2010 - Sasuke application is officially closed. Sorry I haven't been on lately. I think my computer has/had a virus. It wouldn't let me log into Blogger. Today is the first time in several days that I've been able to log in. Maybe the virus went away on its own. Anyway, I'm looking forward to Sasuke 25. I hope all six of the All-Stars compete. I want to see our guys do well. I tried to post earlier, but my computer is acting up again, and I couldn't log onto Blogger. I'm using my dad's computer now. I thought you would like to see this, Elsie. New post on my blog. Some of the picsa come from your blog, but I made sure to say where they came from. Can't type. Let's try "pics." Thanks for the link Tiger! I thought it was cute! It's a shame you are having computer problems.. bleeeeeeeeeeh.. I hate those.. hope you get it fixed soon. My computer is letting log into Blogger for right now, so I'll post while I can. I'm glad you like the blog. I always have fun doing those posters. I'll do some more soon and do another blog about them. I think my favorites are the "What the All-Stars are thinking" one from the 2008 Maguro festival, and the very last one, which I think is from the 2009 Maguro festival. Seriously, in both of those pics, doesn't Shingo look like he's up to something? I love Shingo's sense of humor in things so it's easy to see him in mischievous things. I like Shingo's sense of humor. And he always looks mischievous when he grins. I think it's something about his eyes that makes him look like that. You kinda get the idea that he lies to play practical jokes. He looks like he's a lot of fun to be around. I would love to meet him and hang out with him. Anyways, thanks again for the hard work, I'll definitely be following you. I actually made a blog to start tracking my training/progress - http://americanninjawarrior.blogspot.com/ - though it's in its very infant stage at the moment, as you'll see if you click the link, lol, but lots more will be coming soon, and any tips or comments from yourself would be greatly appreciated! Hey no worries :) We are all rookie fans around here! For ANW information I'd strongly suggest keeping up with Sasuke Maniac Forums. I have the link on the blog at all times.. I .. spend a lot of time there.. LOL Usually arguing with someone LMFAO.. Either way just today they announced ANW2 but did not give a timeline other than "fall" showing on TV. Given the date of Sasuke 25.. I'd think some announcement about actual taping might be forthcoming.. unless they plan to do ANW 2 for Sasuke 26.. which seems extremely doubtful.. nah they couldn't be that stupid.. LOL God I hope not... Either way head on over to SMF as all the others are gathering there. Be mindful of the fact that once you get on Sasuke 25 forums there might be spoilers for the 2 that have already aired (G4 won't air them until.. April.. yeah.. retarded.. Oh my I'm digressing badly..) Either way thanks for posting and I hope you enjoy your stay! Good luck in ANW! Go Rutgers! My hopes is that there will be a new one for each Sasuke.. not one for a couple Sasuke's.. it wouldn't be fair IMO. That said let's see wtf G4 is going to come up with.. airing is in the Fall.. which is totally retarded.. don't get me started on the 23 and 24 airings in April... (facepalm) so we're stuck with whatever idiocy they come up with for ANW. The only reason why I even care is that all Americans are subject to their stupidity. That alone should be illegal.. Good luck with your training and my sympathies in advance and the hoops G4 makes you guys go through.. I thought M9 was ruthless.. G4 is just heartless.